If you thought it was hard to get your hands on ivory from animals that still roam the earth, you can imagine the difficulty in sourcing the material from creatures that died thousands of years ago. 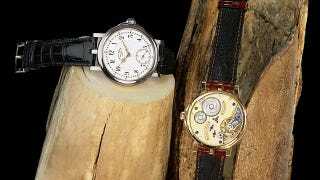 And why these unique mammoth watches cost upwards of $44,000. Crafted by Lang & Heyne in a limited edition run of 25 pieces, the ivory that's used in the Friedrich August I and Johann von Sachsen models was sourced from wooly mammoths that were preserved in the Russian permafrost for thousands and thousands of years. And it's not like the ivory is just being used as decorative accents. It's actually been incorporated into the watch's inner structures and components. So technically, you're probably getting your money's worth given extinction has made sure this particular ivory isn't exactly a renewable resource.